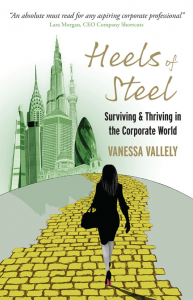 Vanessa’s debut book, Heels of Steel was launched in October 2013.
go here Heels of Steel tracks the trials and tribulations of one of “the most networked women in the UK” and how she left London’s east end, aged 15 to find her fortune in London’s financial district. Despite her doubters and purely through hard work, grit and determination she manages to not only work her way up to what is commonly known as C-suite, but to build two successful businesses alongside her highly pressured corporate career. definition essay ideas Having achieved everything she thought she’d ever wanted, Vanessa quickly learnt that success often comes at a great deal of personal cost and compromise. The constant battling and accomplishment for the ultimate grand prize eventually took its toll and drastically altered her definition of ‘success’, encouraging a life-changing move in a new direction. lady viagra tablets From periods of glittering success to near total derailment due to an unrelenting passion for her career, Heels of Steel unveils the truth behind a woman’s climb to success in the male dominated world of the City. You are invited to follow her journey as she scales (and slips up and down) the corporate ladder, digging her heels in as to avoid being absorbed by the politics and alpha male behaviour still prevalent in so many corporate environments. write my paper for me masters level A mid-career realisation about Vanessa’s deep-rooted need to unveil and be proud of her femininity, helped her to discover things she never knew, and introduced much-needed support that had been glaringly missing throughout her career. follow link The book provides an honest and transparent insight into the world of corporate women and addresses the challenges facing every woman throughout their career journey and tackles our never-ending search for balance. go Heels of Steel is packed to the brim with tips, advice and practical steps based on real life experiences, this autobiographical story is also a practical guide that will fast become a must-read for women seeking to not only survive the corporate jungle, but stand some chance of thriving in it! source site get link Vanessa’s debut book, Heels of Steel was launched in October 2013.
commander du viagra en suisse Heels of Steel tracks the trials and tribulations of one of “the most networked women in the UK” and how she left London’s east end, aged 15 to find her fortune in London’s financial district. Despite her doubters and purely through hard work, grit and determination she manages to not only work her way up to what is commonly known as C-suite, but to build two successful businesses alongside her highly pressured corporate career. prednisone acid reflux Having achieved everything she thought she’d ever wanted, Vanessa quickly learnt that success often comes at a great deal of personal cost and compromise. The constant battling and accomplishment for the ultimate grand prize eventually took its toll and drastically altered her definition of ‘success’, encouraging a life-changing move in a new direction. follow site From periods of glittering success to near total derailment due to an unrelenting passion for her career, Heels of Steel unveils the truth behind a woman’s climb to success in the male dominated world of the City. You are invited to follow her journey as she scales (and slips up and down) the corporate ladder, digging her heels in as to avoid being absorbed by the politics and alpha male behaviour still prevalent in so many corporate environments. companies that i can pay for do my reports A mid-career realisation about Vanessa’s deep-rooted need to unveil and be proud of her femininity, helped her to discover things she never knew, and introduced much-needed support that had been glaringly missing throughout her career. click here The book provides an honest and transparent insight into the world of corporate women and addresses the challenges facing every woman throughout their career journey and tackles our never-ending search for balance. canadian pharmacy viagra paypal Heels of Steel is packed to the brim with tips, advice and practical steps based on real life experiences, this autobiographical story is also a practical guide that will fast become a must-read for women seeking to not only survive the corporate jungle, but stand some chance of thriving in it! https://philmckinney.com/help-i-have-no-money/ I just wanted to pass on my thanks again for a fantastic event, I have had non-stop feedback from around the business about what a great panel discussion it was. Vanessa, you were absolutely awesome. Your stories and advice were not only incredibly inspiring and uplifting, but very relatable and funny too! go Vanessa was our guest speaker at this year’s Founder’s Day. She pitched her talk so brilliantly that she grabbed the attention of all the pupils, who ranged in age from 11 to 18. She was honest and direct, and her talk was both practical and reflective. She made her address so lively and interesting that the girls kept her here for an extra hour, firing questions at her! She was really inspirational. https://www.iama.edu/clinics/viagra-free-gratis.html On behalf of the Connect Women team , I would like to thank you for being our guest speaker yesterday. The feedback I received from the delegates that attended was very positive and I owe that to your engaging and entertaining discussion. I look forward to seeing you again at future networking events.